In the 1830s and 1840s, Frances Sargent "Fanny" Osgood was a prolific and well-known magazine poet, but she is mainly remembered today for her controversial and debatable relationship with Edgar Allan Poe. 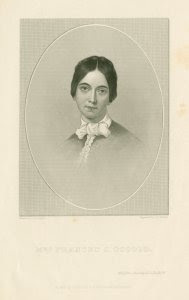 It has often been claimed that Osgood was separated from her husband, a well-known portrait painter named Samuel Stillman Osgood, at the time she knew Poe. There is absolutely nothing to support this belief. 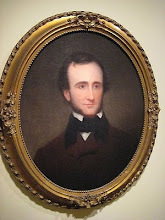 Poe scholar Thomas O. Mabbott was the first to suggest they were separated during 1845, solely on the basis of a poem Mrs. Osgood published in late 1844, "Lower To the Level," where she chided a nameless "you" for neglecting her in favor of others. Since Mabbott's theory was published, other writers have repeated this claim as fact, evidently without bothering to examine whether there is any truth to the statement. 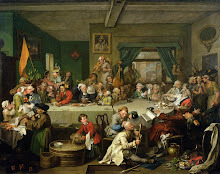 The nature of Samuel Osgood's work led him to travel frequently to execute commissions, but not so much as a hint exists--even among the letters and memoirs of their gossipy and catty literary set--that the couple was ever estranged. Many letters written to Mrs. Osgood during this period indicate that she and her husband were often together. There is even a note of Fanny's to Samuel that is believed to have been written in May 1845--exactly when her presumed infatuation with Poe was at its height--where she addresses him as "my darling love," and goes on to say, "I have only a few minutes to say how dearly and fondly I love you." (This letter shows that either Fanny's assumed love for Poe was a complete fraud, or she was the biggest hypocrite and liar on two feet. In any case, it is clear evidence against an estrangement in her marriage.) Osgood's modern biographer, Mary De Jong, wound up admitting--with obvious reluctance, as she was eager to make as much hay out of Mrs. Osgood's relationship with Poe as possible--that there is no reason to believe that the Osgoods were ever estranged, or that either partner had been unfaithful. It is not clear how much of a personal friendship she and Poe had. They evidently saw each other occasionally at New York's literary "salons," but Osgood spent much of 1845 away from New York City, and she herself later admitted that whatever relationship they had was largely through correspondence. (Her claim--made only after Poe's death--that his wife Virginia encouraged her to befriend him so that her influence would help keep him sober should be treated with the scorn it deserves.) The only letter between Poe and Osgood still in existence is a brief note believed to have been written by Poe to her in October 1845. It is a courtly, but extremely formal letter, addressing her as "My Dear Madam." He thanks her for the "sweet poem" she sent him for the "Broadway Journal," as well as the words of "flattery" which accompanied it, and says that the demands of his work compel him to turn down a social invitation from her until later. Poe biographer Sidney P. Moss commented that Poe addressed Osgood "gingerly" in this note. It certainly does not indicate Poe felt any real personal warmth towards her. A still-mysterious scandal erupted around the two early in 1846. All we know for certain is that, in January of that year, Virginia Poe confronted Elizabeth Ellet (another "literary lady" with designs on Poe) with a letter written by Osgood. This letter (the contents of which are unknown) evidently contained some damaging information about Ellet (that lady later described the letter as containing "fearful paragraphs" that "haunted me day and night like a terrifying spectre.") This led to Ellet feuding with the Poes and Osgood, with Poe himself claiming to possess letters Ellet had written of an unspecified but clearly damaging nature. (The version of the scandal that Sarah Helen Whitman later claimed to have heard--that Osgood had used Ellet as a go-between to retrieve presumably indiscreet letters she had written to Poe--is universally accepted by historians, but there is no evidence whatsoever for this in contemporary references to the feud.) Both Anne Lynch and Elizabeth Oakes Smith--two other members of New York literary circles--later implied that Ellet and Osgood had gotten into a jealous rivalry for Poe's attentions, and their mutual plotting against each other caused Poe himself to unwittingly get caught in the crossfire. That seems as much as we'll ever learn for certain about the whole ugly business. Her third daughter, Fanny Fay, was born soon afterwards, in June 1846. A writer named John Evangelist Walsh published a very strange book in 1980, "Plumes in the Dust," arguing that Poe was this child's father. He presented no evidence whatsoever for this startling theory, and no serious Poe scholar gives the idea any credibility. Indeed, Walsh ignores (I can only assume deliberately) a letter written to Mrs. Osgood in late September 1845--just at the time that Fanny Fay would have been conceived. This letter suggested that Frances was then in Providence, R.I.--with her husband. Soon after the Ellet controversy, Osgood's health, which was always poor, began to decline further, and she died of tuberculosis less than a year after Poe's demise. Eerily, her two surviving daughters (Fanny Fay died in 1847) both followed her to the grave the year after her death. Osgood's letters and published writings reveal her to have been a deeply unhappy, neurotic character who hid her private torments under a histrionic, almost hysterical, show of outer childlike gaiety. Her best poetry showed a certain melodic talent, and occasional flashes of wit, but her prose works are poorly-written, psychologically peculiar, and uninteresting, and all are cliche-ridden and superficial. It is an irony she would not have appreciated that if it was not for her literary pursuit of Poe--a pursuit that brought her nothing but personal trouble--she would be almost forgotten today. Fanny had many faces, Undine, like you. One part of her was very savvy and sophisticated, playing interesting games with audiences and herself alike. It could still teach us lessons about (feminine) identity. Yes, Poe was another mirror for her (and for some of her friends) and he kept inspiring her after the emotional troubles, which left darker streaks. I can refer you to her poem 'A Waking Dream' of June, 1848 - if you can find it. i would like to read this could you point me to it please? i have an 1848 version of Female Poets of America with a section on Fanny. I think I'll donate it to a university library. Oh, good god. That horrid novel had absolutely nothing to do with the real Poe. It was one long stinking libel. "Truth long lies hid but time's long-delayed opportunity at length comes to light--the things that have long been concealed. Truth is the daughter of time." -translation of a Latin inscription carved on a mantelpiece in Ruthven Castle, Scotland. I'm also on Facebook. For my sins. Poe's Perplexing Parents: David Poe, Jr.
Quoth the Reverend. Well, why not? Website for Kristen Lawrence's musical adaptation of "The Raven."